Across the area soybeans are emerged and evaluation of the stand might be needed in some isolated cases. Even though soybeans have a capacity to compensate for low plant populations and gaps within the row, there is potential yield loss from stands that are too low in population. When the soybean crop is planted in rows spaced 7.5 inches apart, the effect of plant population on yield is very small over the normal range of seeding rates and for any particular set of conditions. For a crop planted before May 20 in narrow rows, final populations of 100,000 to 120,000 plants per acre are adequate for maximum yield. Final populations for mid-June plantings should be in the range of 130,000 to 150,000 plants per acre. It is important to remember that soybeans can tolerate low populations very well, with only small reductions in yield potential across wide ranges in plant loss. Recent research from University of Minnesota is consistent with OSU research that populations near 100,000 per acre are likely to produce maximum yields. Soybean stands with populations around 80,000 will yield about 90 percent of the maximum. However, expected yields drop more rapidly in stands below 50,000, with 39,000 plants per acre likely to produce about 75 percent of the normal yield. Researchers at U of M conclude that only those fields with remaining stands below 30,000 to 40,000 plants per acre are likely to produce greater yields when replanted. 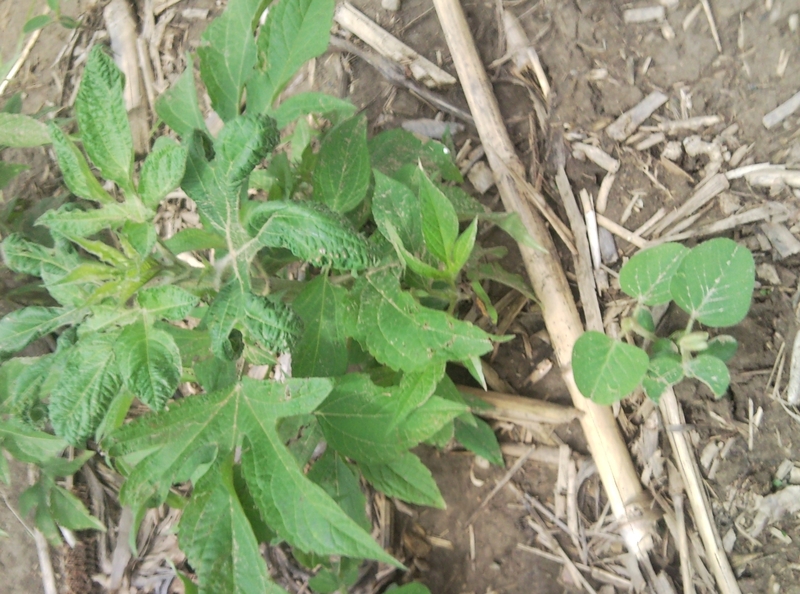 Small, recently emerged soybeans (right) are dwarfed by large giant ragweed (left). Click image for full size. In addition to possible issues with thin soybean stands, there are some weed control challenges in soybeans due to lack of burndown applications prior to planting soybeans. It is not unusual now to see soybeans at 2-3” in height dwarfed by 12”+ giant ragweed or other tough-to-control weeds. Glyphosate is still the most effective herbicide on large weeds, with little risk of crop injury. However, be aware that it does not necessarily provide good control of large weeds in all situations, especially where the weed population has lost sensitivity to glyphosate over time. Large weeds will require glyphosate to be used at a high rate, such as 1.5 lbs acid equivalent per acre in soybeans. OSU Extension Weed Specialist Dr. Mark Loux recommends increasing spray volume to 20 gallons per acre to improve coverage in dense weed infestations, or where spray needs to penetrate into the weed/crop canopy. Where the weeds are the same size or larger than the crop, be sure the nozzles are high enough above the weeds to obtain the full spray pattern distribution. Entry filed under: soybeans. Tags: glyphosate, soybean stand assessment, soybean weed control.